I've been busy the last few weeks, but it seems like all of my time has been dedicated to two things: running and yard work. I started a half marathon training plan that will finish some time in the fall. I haven't signed up for a race yet, but I completed 6 miles this weekend, the furthest I've ever run! I bet my FitBit-focused family is jealous of all my extra steps. I've also been enjoying our beautiful spring days by getting some work done in the yard. Our landscaping looks so pretty with new blooms, leafy shrubs, and fresh mulch. My planting skills came in useful a few weeks ago when I signed up with a group from work to help out with a service project downtown. 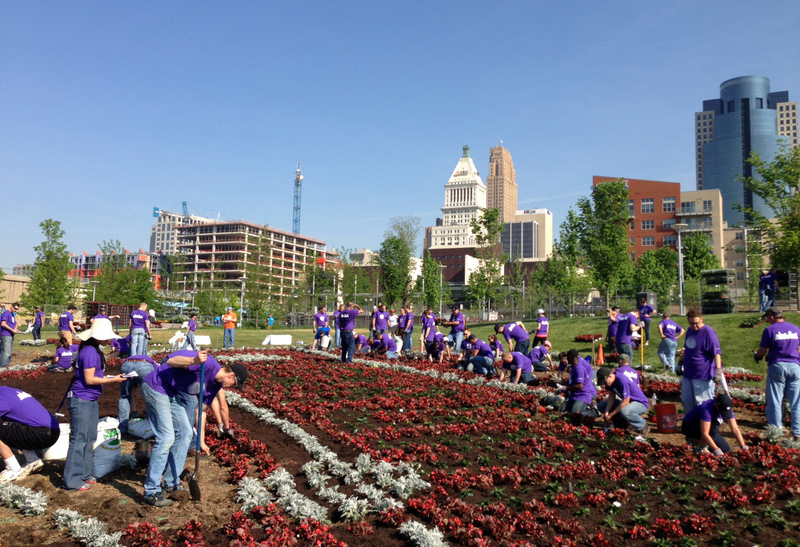 We planted thousands of flowers in a bed near the baseball stadium. The flowers spell out the logo for the Major League Baseball All-Star Game and should look great for the game in July! It's not all running and chores though! We've had a few visits livening up our weekends. Laura came to stay a few weeks ago to cheer on her sister running in our city marathon called "The Flying Pig". On Saturday, we visited a local farmers market to get some fresh pasta for dinner. I love walking through the market and seeing all the interesting treats and meats for sale. I wonder if any of the marathon runners ate these "lucky pig feet" to prepare for the race! Sunday morning we went to multiple locations along the course to cheer on Laura's sister and various other friends who were running. We saw a few people running in costumes, including a shark, a bacon slice, and several pigs (of course). Two weeks ago, I traveled for a girls day with my mom, sister, sister-in-law, aunt and cousins. We did lots of shopping (I found a couple dresses for the wedding we are attending in June) and had a tasty dinner. My dad and brothers had a boys day playing disc golf and texted a picture of their outing. We responded with a picture of us at the mall. 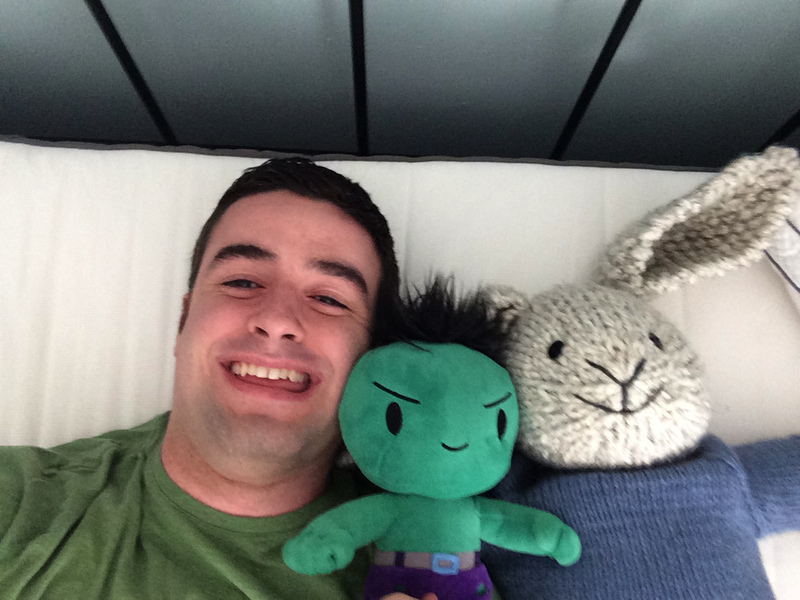 Dan, who was enjoying a relaxing weekend alone at home, responded a few minutes later with this photo of him hanging out with Baby Hulk and the Giant Knit Bunny... We were all cracking up! I drove back home for Mother's Day on Sunday. As much as I wanted to celebrate my own mom, I was pretty sad and anxious about it. We visited Nolan at the cemetery and left some pretty irises that had bloomed in our garden. Afterwards we drove to Kings Island to buy our season passes and distract ourselves with some roller coaster rides. Overall the actual day wasn't as bad as the anticipation of it. We had more visitors this past weekend when Christopher and Emily came to stay for the first time! We spent hours on Saturday at IKEA looking at furniture for their new home. I always enjoy guiding people through IKEA for their first time... It's certainly an experience (plus I like giggling at the silly product names). For dinner we went to the Hofbräuhaus for delicious beer and German food, and then went home to try out Dan's birthday gift from Christopher and Emily, an expansion pack for our board game Carcassonne. Yay!